What is an Invasive Species? 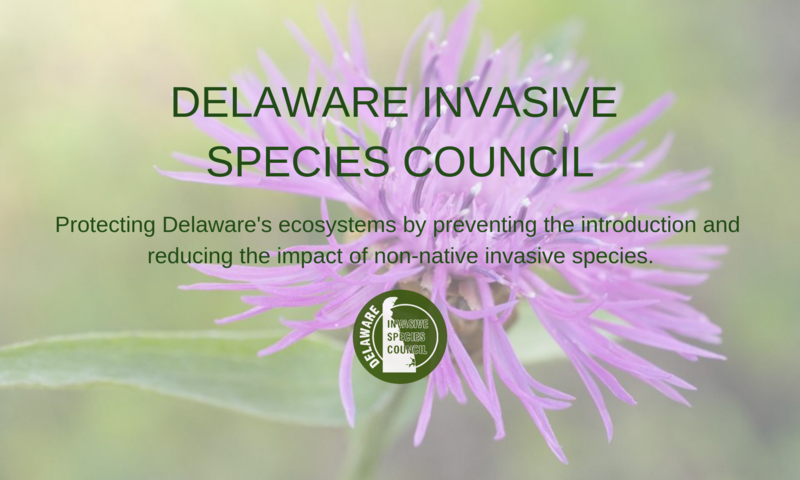 – Delaware Invasive Species Council, Inc.
Why are invasive species “bad”? Reduce native diversity by competing for resources, such as space, sunlight, water and minerals. Alter nutrient cycling by changing the amount, composition, or rate of decay of leaf litter. May hybridize with native species. Disrupt natural communities and change habitat structure for other organisms such as birds, mammals, turtles, fish and frogs. Delaware has a series of laws and regulations designed to prevent the import and establishment of invasive species. Two state agencies, the Department of Agriculture (DDA) and the Department of Natural Resources and Environmental Control (DNREC) administer laws involving invasive species. These agencies have a number of regulatory tools available to State agencies, namely the following: permits and licenses, transportation and shipping requirements, monitoring, and bonds and insurance. The Plant Pest Law grants DDA the general authority to prevent the introduction of, or to control dangerously injurious plant pests. Legal instruments include quarantines, permits, penalties, and the authority to write additional regulations. A license from the DDA is required for persons to sell or distribute plants, nursery stock, or horticultural products. Imported plants and nursery stock must be accompanied by a certificate from the state of origin, ensuring that the plants have been examined and found (apparently) free of dangerously injurious plant pests. Beekeepers in Delaware must register with the State, and have their apiaries examined at least annually. The importation of bees or used beekeeping equipment requires an entry permit from DDA, also presentation of an inspection certificate from the State of origin stating that the bees or equipment are free of all diseases, mites, and Africanized honeybess. The introduction of any species of domestic or wild animal onto lands administered by the Division of Parks and Recreation, DNREC, is prohibited. A permit is required to import, possess, sell, or exhibit any live wild mammal or live reptile not native to or generally found in Delaware however, DNREC can exempt mammals and reptiles that do not represent a significant threat to community interests. Miscellaneous wildlife are covered under Delaware Code Title 7, 768, 770, and 795. No person may catch, possess, purchase, transport, or ship any wild bird other than a game bird, except as expressly permitted by law. The DDA may enter any premises where exotic avian species are kept to determine if any birds are infected with a contagious disease capable of affecting poultry. DNREC Department of Fish and Wildlife (DFW) must grant permission to stock any species of fish in the non-tidal public waters of Delaware and to transport, purchase, possess, or sell walking catfish, white amur, or grass carp. Aguaculture activities must not promote the introduction of any nonindigenous species that harbors disease or parasites or are capable of competing with indigenous plant or animal species. Every fee-fishing operation must be registered with the DDA, and it must be a closed system. Under existing law, DNREC may institute programs of control for common reed (Phragmites australis). The Department has the authority to enter into agreements with counties to survey and control this species. The surface waters of Delaware must be free of substances attributable to wastes resulting from human activity, including any pollutant that may result in the dominance of nuisance species. Nuisance species are fish, other animals or plants living in or near the water, which cause unreasonable interference with the designated uses of the waters or of adjoining land areas. The DDA currently designates 4 plant species as noxious weeds; Canada thistle (Cirsium arvense), Burcucumber (Sicyos angulatus), giant ragweed (Ambrosia trifica) and Johnsongrass (Sorghum halapense). It is unlawful to allow any of these weeds to flower or exceed a height of 24 inches. DDA administers a Seed Law, which allows the Department to sample, inspect, analyze and test seeds transported within the state. The Department has authority over prohibited noxious weed seeds and restricted noxious weed seeds. It is illegal to transport or sell agricultural, vegetable, flower or tree or shrub seeds within Delaware containing prohibited or restricted noxious weed seeds. Animal feed, fertilizer, and soil conditioners sold within the state must not contain an excess amount of viable weed seeds. DDA regulates and controls the sale and use of biological control agents, to ensure their safety and effectiveness. Movement, shipment, and sale of biological control agents requires a State and Federal permit.